Watch Jennifer Aniston and her loser friends get terrorized by an evil Leprechaun. All the ingredients and talismans from classic Leprechaun-lore are there including the 4-leafed clover, rainbows, and pot of gold. Even though this movie about a demonic Leprechaun probably only exists because the writers were scraping the bottom of the how-can-we-make-this-fairytale-character-who-isn’t-in-a-horror-movie-yet-scary barrel, it is a classic and entertaining splatstick. 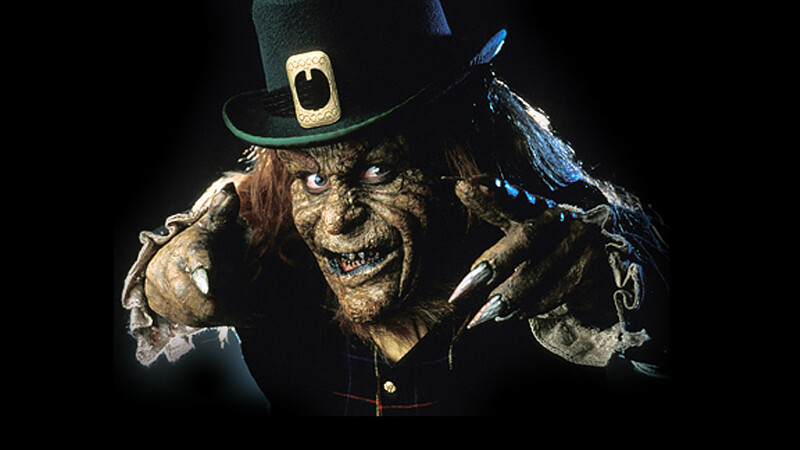 If you’ve never heard of the films, the Leprechaun is a crude and slightly racist midget who loves LOLing at torture and death. He has magic powers which he uses to murder people in ironic and Looney Tunesesque scenarios. Some 1980’s bro finds a pot of gold in Ireland and the Leprechaun hides in his luggage and makes his way back to the States. He murders the guy’s wife and drives him insane. The bro uses a 4-leafed clover to trap the Leprechaun in a box. Some 90’s bros accidentally free the Leprechaun from his prison ten years later and he immediately begins a killing spree motivated by his misplaced gold. The kills are cool and the cartoonish tone that the movie takes makes it fun. You laugh while people are injured and killed and the Leprechaun drops numerous puns/one-liners. The comedy is mingled with the horror aspects of the film in a very successful way; there is serious gore, but also a Leprechaun cackling while riding a tricycle. At one point, he even smashes into Jennifer Aniston’s vehicle in a little Leprechaun car. Before he can reclaim all of his ducats, the Leprechaun is killed by a 4-leafed clover / gasoline explosion combo. His little skeleton is proof that he’s been killed. There is a lame cliffhanger involving a single gold coin. The cult success of this film inspired several sequels and (unfortunately) multiple imitators that tried to capitalize off of the adored elements of the film. All of a sudden, there was a Rumpelstiltskin movie, a “Wishmaster” movie, tons of elf/fairy horror films, and (incredibly) more Leprechaun horror films not associated with this character or franchise.